She stands there smiling, nodding her head, responding but not listening. They want to see the superwoman. So, she wears the mask. She hides her pain, her shame, her anger, her hurt behind the mask of her smile. Afraid her truth cannot be accepted. Afraid that her truth will keep her from being loved. I must admit, I know this woman. She has been me. For more years than I care to admit, I lived a life untrue to myself. Camouflaging my passions, my purpose, and my gifts, the real me was hidden behind smiles hoping to gain acceptance and love from others. Quickly, I learned to play the game showing others the person they wanted me to be. When we accept Christ, we come to realize that God gains no glory from us living a fake life, hidden behind masks seeking to win the approval of others. 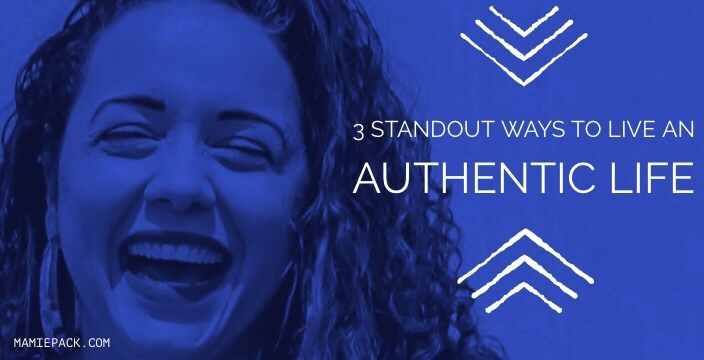 So if you are at the point you want to break free from the mask, then here are just three ways you can live your life authentically. To live our most authentic life, we cannot hate the experiences that helped shape who we are. Denial and shame get in the way of being able to embrace our story so we can live an authentic life. Shame wants you to think you are unlovable, beyond redemption. Yet, we know in God’s word that “all things work together for the good for those who love the Lord and are called according to His purpose” (Romans 8:28) and His plans are for our “peace and well-being and not for disaster, to give you a future and a hope” (Jeremiah 29:11). Yes, we have made some mistakes. Some bad things have happened. You can live your life behind a mask ashamed, filled with guilt, or you can live seen in freedom through Christ. Repent and surrender it all to Him. Only Jesus Christ can transform us into new creatures (2 Corinthians 5:17). His blood redeems us. We are not our mistakes. So embrace your story for HIS glory and come from behind your mask. Before anyone had an opinion about your life, God already created a divine purpose for you. The only way we will be able to be live a life true to ourselves is by knowing God’s truth. What does He say about you? What does His word say about being a wife, a mother, or a friend? You see, other people will always have an opinion about who you should be. They will say things like “you are too much,” “why you always gotta act like that?”, “Girl, you’re special.” We grow up hearing our people comment on our bodies, our hair, and our personality. But you know what, God gave you that curly hair. God made you an introvert. God created your loud laugh. When we place more value in the criticism of people than we do God, we start living a life to please people instead of pleasing God. So know HIS truth. Get in His word and write it on your heart. Every area that you feel insecure get in His word. Talk to Him in prayer. Allow God to show you who He made you to be then you can walk boldly in His purpose for your life. Only when we align ourselves with the truth of God’s word are we able to live a life seen, loved and purposed. Embracing your happy means accepting others may be disappointed, upset, disagree, or just don’t care with the choices and decisions you make. . You know what, that’s okay. Allowing the approval of others to be the foundation for your happiness and joy is like building on sinking sand. Your happiness and joy will never be stable. Do you know what makes you happy? Really. Like could you answer that question if I were standing in front of you? For a while, I couldn’t. Most of my life revolved around trying to keep people that I lost me. If you don’t know, take some time figuring it out. Try new things. Be okay doing those things along. If other come cool, but if not—go anyway. Most importantly, know that joy only comes from a relationship rooted in Christ (Nehemiah 9:10). Not allowing my happy to be based on others perceptions of me is so difficult. My nature is to please others and be happy in their happiness and not always my own. I enjoyed reading your post I think I personally need to work harder at embracing myself and my happy. Thank you!!! All of our experiences, the good and the bad, help shape our testimony. Overthinking would probably be the hardest one for me to overcome. I’m glad you found something (god) to help you find your true self. Accepting what I cannot change helps me be happy; thank you for the reminder to embrace what I have and what is. Yes! We spend so much time focused on the wrong things and miss the main things. Amen! You have to strip off your mask and learn to accept and love yourself. Absolutely!!! Take that mask OFF!!! I was this girl too. I masked myself completely…I tend to do so still if I can be honest. I’m better now at accepting all of me and God has given me the strength to do this. My strength alone is nothing compared to his love and grace. I’m only human but he loves every part of me unmasked and I make a choice daily to show that. Celebrate the wins! You are not where you used to be and that is big. It is a daily decision to live authentically. Cheering you on! 😍 thank you for that! I LOVE this!! Especially embracing TRUTH over opinion. I used to be bound to other people’s opinions and I’d put so much emphasis about what they thought of me. Once I learned that God’s opinion was the only one that mattered, I’ve been free to live my life with purpose. Awesome post! Amen!!!! It’s amazing how much we can truly LIVE our lives when we live it for Christ and not the approval of others. I have also always based my decisions around what makes other happy. It is so hard for me to not do this but I know I need to make a conscious effort to embrace what makes me happy and not others. I needed this reminder today to stop focusing so much on others! As a mom, it’s hard sometime to focus on yourself! Thank you for sharing! So true!!! As moms, when we get it we can help our kids get it too. Mamie, I’ve read about removing the mask many times. But your take on it is fresh insight. This is so powerful, “When we accept Christ, we come to realize that God gains no glory from us living a fake life, hidden behind masks seeking to win the approval of others.” When I finally learned to walk in authentic community with others (still a work in progress), it not only healed my soul, but gave such a release and freedom from pretending. Thanks for sharing! Thank you so much for your kind words Karen! Authentic community has changed my life too. It is freeing to be around people who love you through the seasons. This is so great! I love this post! Being honest with yourself, God, and others is one of the best things we can do for ourselves. It really is and so freeing too! It takes courage to be authentic Ama stop living for others! I especially love the tip about owning your story! We only have 1 life to live and we should live to our audience of One! Yes! Live your life and own your story. This is such an important message to send to women. Research shows that the number one emotion that moms feel is doubt. So many wear masks to cover it up. Thanks for sharing this encouraging message. Sadly Lisa you are right! Wearing that mask hurts us in so many ways. Such a good reminder! Thank you for sharing your heart with us. Thanks for your kind words Karin and stopping by. I’m so glad I read this! With a new year approaching I’m definitely seeking ways to make a lifestyle change. I want what God has for me and I know in order for that to happen I have to let go of some things. I can’t live my life for other people anymore! I have to embrace my own happiness and take off the mask! Thanks again for this. It is so true and very necessary for a fulfilling life. “I want what God has for me.”—-I agree 100% with you Keyona. Now that is a declaration! Anyone who visit's Mamie's page will be blessed and receive authentic content we can relate to and apply to our lives. Must read blogs. I highly encourage you to tune in and share with those around. Her blogs are such a blessing. Join the journey-don't miss out!